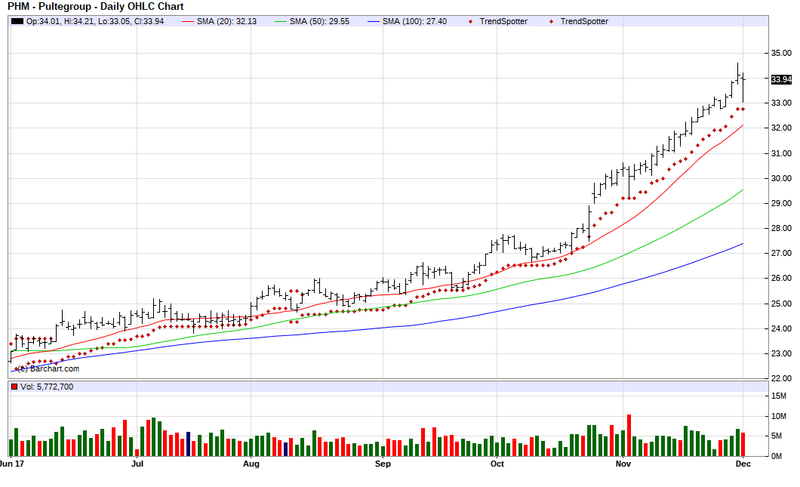 Today's Chart of the Day belongs to PulteGroup (PHM). Last night, I was discussing with Carole of Melbourne Beach all the different ways I used Barchart to select the Chart of the Day and how useful all of their sorting tools are. Today I used Barchart to sort the Russell 3000 Index stocks first for the most frequent number of new highs in the last month, then again for technical buy signals of 80% or more. Next I used the Flipchart feature to review the charts for consistent price appreciation. 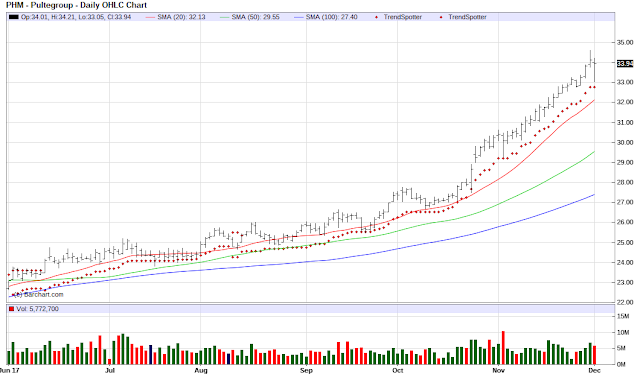 Since the Trend Spotter signaled a buy in 8/15 the stock gained 32.94%. Pulte Corporation is a publicly held holding company whose subsidiaries engage in the homebuilding and financial services businesses. The company's significant subsidiaries include Pulte Financial Companies, Inc., Pulte Diversified Companies, Inc., and other subsidiaries which are engaged in the homebuilding business. Carole, I hope this pick pays off for you.